A colourful wooden puzzle board of a snake. 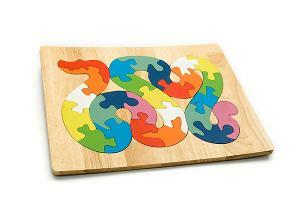 This wooden snake puzzle board consists of 26 pieces. The pieces of this wooden puzzle are cut out of a massive and solid wooden plate. This wooden toy is hand made and produced out of sustainable and massive natural wood. This wooden toy is an ideal toy to play with and stimulates the development of the fine motor skills of your child. Each wooden puzzle board is individually branded by the natural grains of the wood and the touch of the craftsman.